The Ma’man Allah cemetery is located within the grounds of West Jerusalem’s Independence Park. The cemetery is of ancient vintage. It dates back to at least the 12th century. There are some archeologists who believe it may even date back to the time of the prophet Mohammed (PBUH). The chief attractive element of [Independence] park is the Lion’s cave which lies inside the park . . . This cave lies to the east end of the park which also houses an old Islamic cemeteryin the grounds. An “old Islamic cemetery” indeed. Ma’man Allah is much more than an “old Islamic cemetery”. It is rapidly becoming a purloined cemetery. And what does Israel’s Supreme Court have to say on the matter of the Case of the Purloined Cemetery? On February 10, Israel’s highest Court gave final clearance to the city of Jerusalem and the Los Angeles-based Simon Wiesenthal Center, to build a complex with the grotesquely ironic name, the Center for Human Dignity-Museum of Tolerance. [The complex] is being built on Jerusalem’s former municipal car park, where every day for nearly half a century, thousands of Muslims, Christians and Jews parked their cars without any protest whatsoever from the Muslim community. Columbia University professor and author Rashid Khalidi, whose ancestors are buried at Ma’man Allah, was a studio guest on Democracy Now. He has a different reading of the cemetery’s history. RASHID KHALIDI: This is a cemetery where people have been buried since the twelfth century. People who fought with Saladin in the Crusades are buried there . . . Contrary to what Rabbi Hier said, that parking lot was built over part of a cemetery. The Israeli authorities are basically pushing ahead with the desecration of a cemetery that they have been, unfortunately, slowly nibbling away at for over three decades. We and other families are taking action as a group of families to try and stop this, after other families failed in the Israeli Supreme Court. AMY GOODMAN: The fact that he said this has been a parking lot that no one has protested for years? RASHID KHALIDI: . . .many protests were made. There were protests made from the early ’60s, when the first of these desecrations started. [What Rabbi Heir said is] false. And the fact that it was desecrated in the ’60s does not mean that it is right to desecrate it further. The CCR filed its petition two days before Abraham Lincoln’s 201st birthday, adding a poignant historic note to the irony in the names that would adorn the new museum, “human dignity” and “tolerance”. According to the CCR website, “the Petition was filed with the U.N. Special Rapporteurs on Freedom of Religion and Belief and on Contemporary Forms of Racism; the Independent Expert in the Field of Cultural Rights; the High Commissioner for Human Rights; and the Director General of UNESCO. The CCR has an impressive history as “a non-profit legal and educational organization committed to the creative use of law as a positive force for social change.”, starting with the civil rights movements in the American South in the 1960s. In her interview on Democracy Now, Amy Goodman asked Michael Ratner, the current president of the Center for Constitutional Rights, about his most recent visit. I was really shocked by what I saw. I went into West Jerusalem, and I see a wall that’s probably twenty-five feet high, surrounded by surveillance cameras, which is where they’re building this so-called Museum of Tolerance. Right up to the edge of it, you see Muslim graves, Palestinian graves, all around it. And within even the part of the cemetery that still exists, which is only a few acres, because the Israelis have paved over other parts or built a park, it’s been desecrated. And every time they, Muslim people, attempt to fix it, it’s desecrated again. And within the site itself, I mean, [one] archaeologist . . . called this an archaeological crime. This is an Israeli archaeologist. And you see they took out bones in cardboard boxes, relatives of the descendents of the people on this petition— And they have no sense of where those people are. And the archaeologist said there’s at least 2,000 other graves under this site. So, to hear the rabbi from the Simon Wiesenthal Center talk about “there’s no bones, there’s no bodies under here” is just—it’s just a lie. That’s all I can say. That’s what it is. Last week, London Independent columnist Robert Fisk attended the 10th annual Herziliya conference where once a year Israel’s political and governmental leaders gather for policy discussions. We heard that Israeli officials might not be able to travel for fear of war crimes indictments against them – which suggests that Goldstone’s report is indeed biting. Israel’s leaders fear the public relations fall out and the possible legal complications looming from the Goldstone Report, but they heard reassuring words from Danny Ayalon, the Deputy Foreign Minister who preposterously ‘sofa-ed’ the Turkish ambassador last month. Ayalon, a former Israeli ambassador to the United States, obviously smells defeat for Obama’s original Cairo message of pro-Muslim appeasement and criticism of Israel. Fisk reports that Ayalon assured the conference that the Israeli-American relationship had “never been better”. I would like to speak not of disengagement, but rather of engagement: engagement with our heritage, with Zionism, with our past and with our future here in the land of our forefathers, which is also the land of our children and our grandchildren. . . our existence depends on our ability to explain the justness of our path and demonstrate our affinity for our land – first to ourselves and then to others. On his way to the sea coast resort at Herziliya, Fisk stopped by a small Tel Aviv library, which houses 20,000 books and documents that once belonged to David Ben Gurion, Israel’s founding father and military leader in the 1946-48 war. Even as he laid plans for the take over of Palestinian land for a future Israeli state, Ben Gurion was concerned to protect Israel’s status as a young nation known for “its moral image”. He issued orders, for example, as early as 1948, that no Muslim nor Christian place of worship nor sacred site was to be harmed by Israeli soldiers. He promised bodily harm to any soldier guilty of violating that order. Displacing living people — something Israel does every single day — is hardly any better than displacing dead ones. This disgraceful episode is only part of a much longer history of displacement and dispossession dating to 1948. Within a few days, the Times published its inevitable “other side” rejoinder, written by Rabbi Heir. There has never been any doubt about the centrality of the 33-acre Mamilla [Ma’man Allah] cemetery to Muslim practice in Jerusalem. Throughout the 1800s, Ottoman rulers “fastidiously” recognized the boundaries of the cemetery by surrounding it with a wall and roads. In 1948 the Israelis took over West Jerusalem. And from the beginning of Israeli rule, Muslim authorities appealed to Israel to protect the cemetery. 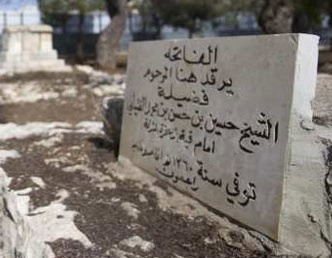 In 1948 the Israeli Religious Affairs Ministry said the cemetery “is considered to be one of the most prominent Muslim cemeteries,” with remains going back to the great general of the Crusades, Salah-ah-Din. “Israel has gradually expropriated and destroyed most of the cemetery.” It began by building an “Independence Park” over half the cemetery in the 1960s. Then in 1964, it built that parking lot Hier refers to, over about three acres of the cemetery. Then it built an underground parking garage and ran cables and other infrastructure through the site. Palestinians have never been silent about the desecration. On at least one occasion they petitioned UNESCO to stop it. In recent years, the Israeli Antiquities Authority awarded the 3-acre parking lot site to the Simon Wiesenthal Center to build its Tolerance hall on, and an archaeologist was sent in to see what was going on. The report of this “Chief Excavator” was emphatic: There are thousands of graves under this parking lot that date to the 12th century. They have already been disturbed by construction. Some of these bodies have been removed. The construction zone is shrouded in secrecy. If just one of those bodies were Jewish, the petitioners demonstrate, construction would stop in a nanosecond. And so the battle is joined. The state of Israel does what it pleases with an ancient Islamic cemetery, just as it does what it pleases in its attacks in Gaza and the West Bank. Are there no Israel leaders who see beyond Netanyahu’s obsession with “our affinity for our land”? Are there no American political leaders with the courage to take Bibi’s keys away from him before he drives Israel over the cliff? The picture above from Jerusalem’s Ma’man Allah cemetery was taken by Dan Balilty for the Associated Press. It ran in the Los Angeles Times. The photo of Robert Fisk is taken at the wall surrounding Abu Dis. It was taken by Quique Kierszenbaum for the London Independent. I wonder how many leaders in this country have the courage to step forward and protest this obvious desecration of antiquity, in the name of human rights? On May 28, 1948 the Arab Legion completed the capture of the Jewish Quarter of the Old City of Jerusalem.After the Jewish Quarter of Jerusalem was captured, the destruction, desecration and systematic looting of Jewish sites began and continued. 57 ancient synagogues (the oldest dated to the 13th century), libraries and centers of religious study were ransacked and 12 were totally and deliberately destroyed. Those that remained standing were defaced, used for housing of both people and animals. The city’s foremost Jewish shrine, the Western Wall, became a slum. Appeals were made to the United Nations and in the international community to declare the Old City to be an ‘open city’ and stop this destruction, but there was no response. This condition continued until Jordan lost control of Jerusalem in June 1967. I’m hoping to visit the Ma’mam Allah Cemetery when I’m in Jerusalem in January. I’m making a documentary about funeral rituals within Judaism, Christianity and the Islam. This cemetery would be beautiful to film if that is allowed. I’m hoping that someone who reads this can help me to get in contact with someone who can help me. This is unbelievable but not unexpected.